As a musician, photoshoots are a necessary part of your continuous to-do list. You need photos of yourself and your band for a number of reasons, including album covers, social media profiles and content, press, and so on, so you'll need to be in front of a camera at some point, even if it makes you nervous. The form your photoshoot takes — everything from several expensive hours in a professional studio to your friend and their iPhone — can differ greatly, but the things you need to think about before, during, and after the event are the same, no matter what. If you're going to invest the time, energy, and probably even money into a proper photoshoot, make sure you try many different looks, options, angles, and so on. It takes a lot to have to go back and do another shoot, but it only takes a few seconds to snap a few quick shots from another perspective or in another light. Imagine paying for a photoshoot, only to have a member leave the band a few weeks later. Or, think about a publication asking for a vertical pic, but you only have horizontal shots. Come into the shoot with a list of every possible option, talk to the photographer about them and why you need to take the time to do this correctly, and then make sure you cross everything off that list... and then some! Sometimes, you’ll hire a photographer who has a certain perspective or who is known for a certain kind of look, and that can be great! Some photographers have a signature, but you need to make sure your brand shines through as well, especially if the person behind the camera isn’t known for anything in particular but great shots. Who are you as a musician? As a person? What is your band known for beyond the music? Are you dark and serious in your manner? Funny? Do you all dress up in a certain costume or color? It doesn’t matter what your brand is, you just need to ensure it’s visible in the photos you’re taking. You want people to immediately identify the picture with your band or your solo persona, aside from, you know, your face. When the photographer sends you a batch of finalized photographs (sometimes they requires editing, if that’s what you two agree on), make sure you receive full-size, large images. It’s easy to be focused only on who looks the best in which images, but you need to put your technical hat on for just a short while and ensure you’re getting what you need because, if not, it might be an issue later on. Talk to your photographer before you begin or ensure that the camera being used (even if it’s someone’s phone) is shooting in the highest resolution possible. It won’t be often that you need an image that’s extremely hi-res or oversized image, but every once in a while, it will be required, and it’s better to be prepared. Hi-res, large pictures are sometimes asked for by publications, and those printing your CD covers or making merch might also need them. Don’t fight with someone later on or scramble to take more pictures — just get it right the first time. It’s usually incredibly easy to switch modes and make sure you’re doing things correctly when you snap pics. You just need to ask. 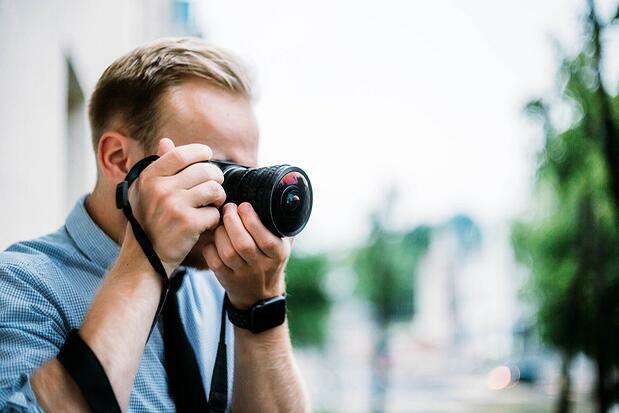 This might not be an issue until later in your career or until you hire a well-known photographer, but it’s certainly worth keeping in mind. Sometimes even the subject of the images, even if it’s a person or a band that has hired the photographer, won’t own the photographs after all is said and done. That’s not an issue when it’s someone taking live shots for a publication or shooting a band for a magazine, but it will be very problematic if you’re looking to collect many snaps to use as you like. Don’t get tricked into buying pictures after you’ve already paid for a shoot or license. Hire someone who will allow you to own everything outright so you never have to think about using the images after you’ve worked with the photographer. Before you’re done with the photographer you chose (even if it’s just a friend), make sure you have all their info, including how they’d like to be credited for their work. Just because you paid for the shots and own the rights to the images, that doesn’t mean you shouldn’t still credit them for their artistry. What name do they want to go by? Do they have an Instagram or Twitter they’d like included when their name appears next to a published photograph? You should do your best to ensure those looking at a picture of you and your band can find the person behind the lens if they like, as they might want to hire them for their own shoot. It’s also worth mentioning that some publications require this information in order to use a photo, so you need to make sure you have it on hand anytime you send them anywhere. Thousands of photos can be taken at a photoshoot, but so many times, I’ve heard of artists or bands (or those not in music but who have a need for a photographer for some reason) only holding onto a dozen or so images when all is said and done. I’ve never understood that! Sure, some are better than others, but why wouldn’t you make use of as many of those pictures as possible? Make sure you get as many shots from the photographer as possible, if not all of them. You’ll only pick a few as your press images or those that will be included on your album cover, but that doesn’t mean there aren’t many other uses for the rest! If you follow my first rule and try different angles, lineups, and even costume changes during your shoot, you and your bandmates will have tons of images that can be great for social media for months or years to come. If you have them, use them!